After my chief taster retired from his demanding career, instead of making packed lunches for him, I was confronted with the challenge of putting a light tasty lunch on the table. Unfortunately he has never learned to cook, and it’s not that we haven’t tried to teach him, but you know what they say about old dogs…..
From experience I knew that if I left him to his own devices he’d make do with coffee and cookies. Not wanting to be a galley slave I decided lunch in retirement had to be quick to prepare, tasty, based on vegetables and satisfying. I quickly got into a rut of soup, sandwiches, salads, soup, sandwich, salads. Leftovers from dinner are a godsend. A quick round in the microwave and voila, lunch. Occasionally inspired by leftover cooked vegetables I’d make a frittata or turn leftover rice into wok fried rice. Then I discovered fritters. 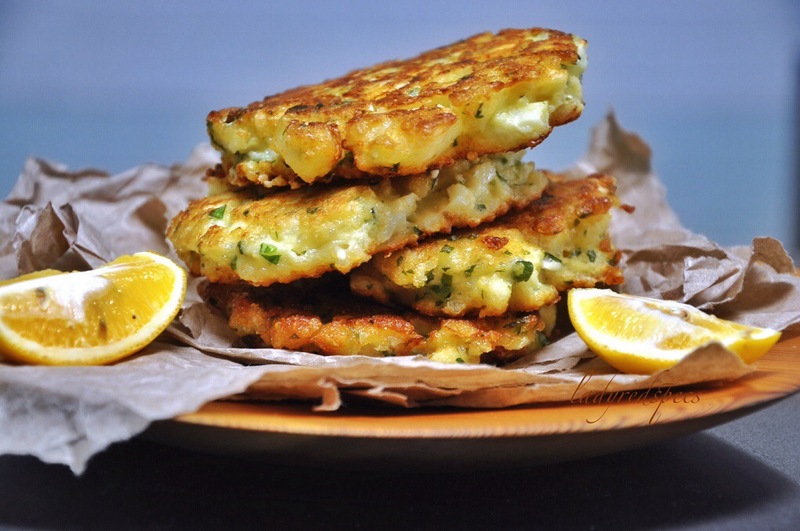 An infinite variety of vegetables, cheeses, herbs and grains can be turned into fritters. Served with salad, burger style or simply topped with relish they are a fabulous lunch dish. I regularly make zucchini fritters, curried carrot fritters, (recipes coming soon) mixed vegetable fritters, roasted vegetable burgers and corn fritters. I recently came across an idea for cauliflower fritters in a “Coles Food Magazine” which was the starting point for this post but after several meals of cauliflower fritters to refine the recipe it now bears little resemblance to the original. In a bowl combine the cauliflower, feta cheese, quinoia, chopped herbs, flour and baking powder. Whisk together the egg and soured milk then stir into the dry ingredients to make a thick batter. Shallow fry heaped tablespoons of the batter in small batches until golden, turning once. Keep the cooked fritters warm I the oven while you fry the remainder of the batter. Delicious served with a squeeze of lemon juice. Frittatas are immensely versatile. I love them. Kookoo is (to some extent) the Persian incarnation of a frittata by the way, you may want to check those out as well. He’ll never retire from the tasting job, I just asked!!!! I’ve recently discovered beautiful organic eggs from the farm gate on a road I travel often, so any new ideas with eggs are welcome. I’ll take a look at Kookoo, thanks for the recommendation. Yum! I can’t wait to give these a go. With a couple of slices of avocado and some roasted tomatoes I have breakfast sorted for tomorrow morning – thank you! I have to echo Lidia… brilliant combination of the ingredients! They look so delectable… beautiful photo of the fritters. YUM! These look so delicious. Anything with feta. i must be the last person on WordPress who still hasn’t prepared quinoia in any form. I need to change that because these fritters sound fantastic. Hardly know what to do with quinoa (only got the hang of pronouncing it recently). Your fritter recipe sounds delightful. Thank you Mary, it’s nice to hear from you. You’ve being laying low recently! Hope you feel brighter soon!!! I love this recipe! I’m so glad you are back and posting such inspirational dishes. Well, it was fun reading about your adventure…. 🙂 I’ll have to make these fritters for sure. I think I may go ahead and try it will dill. I’m crazy about the dill and feta combination. Glad you feel inspired to try the fritters! I’m glad to be home in my “proper” kitchen with fresh ingredients easy to hand! Let me know how you like the dill version. Mmmm, these fritters do look great. 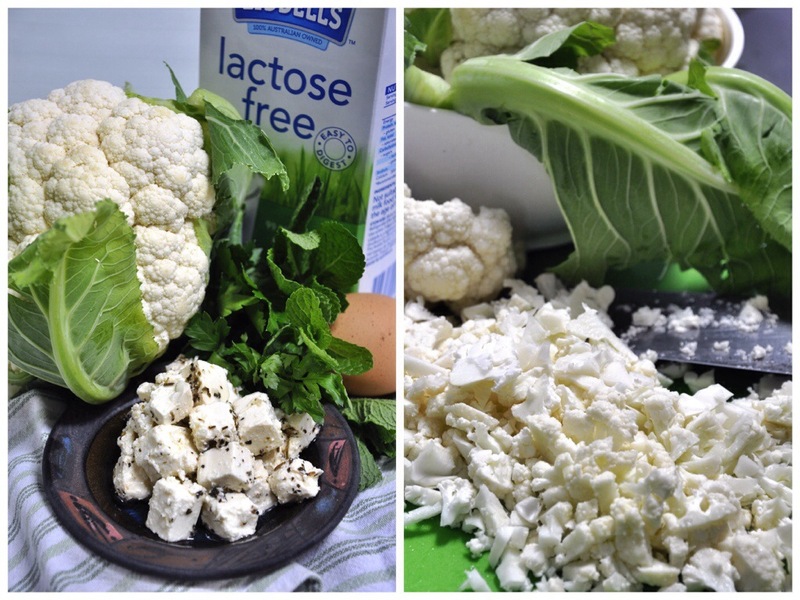 And what an innovative idea to use cauliflower and feta. I just had to pin that photo, they’re so gorgeous! I’ll be giving these a try real soon. Thanks for the pin and enjoy the fritters when you make them! These look very good. I’m always on the ookout for good gluten free lunch ideas for my son and I bet these would be delicious cold with a bit of salsa on the side. What are your thoughts on the different types of quinoa – wondered whether to use the black or red type in these fritters for a bit of a flvour difference. I love these! They are simple and quick, but at the same time they must have been satisfying and delicious. I love fritters, they always look nice on a plate, and you can put almost anything in them! Great idea for lunch! ohhh this looks really good! Thanks a few false starts, but in the end they were worth it! This entry was posted on October 15, 2013 by ladyredspecs in Breakfast and Brunch, FODMAP diet, Food, Gluten Free, Light Savoury Dishes, Vegetarian and tagged cauliflower, feta cheese, fritters, gluten free, quinoia, vegetables.